Outside the Embassy of Ecuador, London. Flat 3b, 3 Hans Crescent, London, SW1X 0LS. Nearest Tube station Knightbridge. In August 2012, after weeks of consideration of evidence, Ecuador recognised that Julian Assange’s work with WikiLeaks made him a target of politically motivated harassment and that extradition to the United States on espionage and treason charges was a real and present threat. 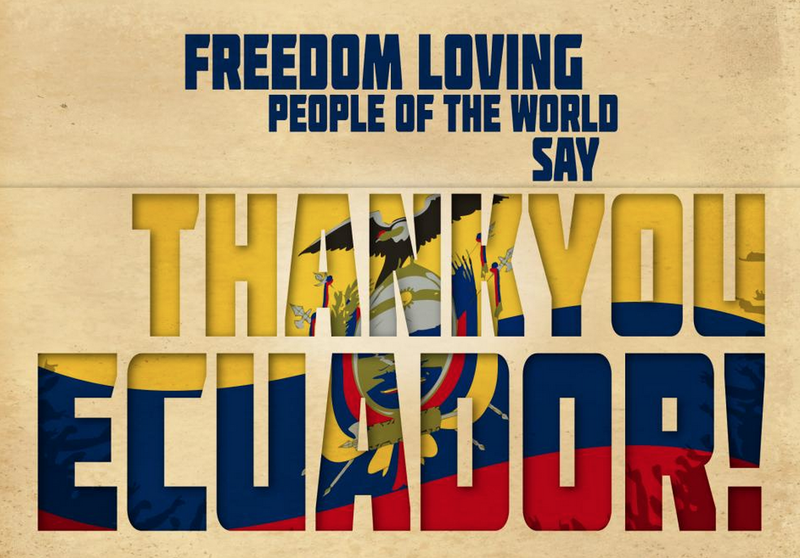 It is important to recognise the basis of Ecuador’s decision, clearly vindicated, and the background of persecution of whistle-blowers such as Chelsea Manning, Edward Snowden, John Kiriakou, Jeffrey Sterling, and WikiLeaks’ Sarah Harrison – who is no longer at liberty to return to the UK. It is also worth recalling the intimidation that Ecuador faced from the UK government, backed by London’s Metropolitan Police, at the time and how this continues to this day. “The siege of Knightsbridge is both an emblem of gross injustice and a gruelling farce. For three years, a police cordon around the Ecuadorean embassy in London has served no purpose other than to flaunt the power of the state. It has cost £12 million. The quarry is an Australian charged with no crime, a refugee whose only security is the room given him by a brave South American country. His “crime” is to have initiated a wave of truth-telling in an era of lies, cynicism and war”. Indeed. 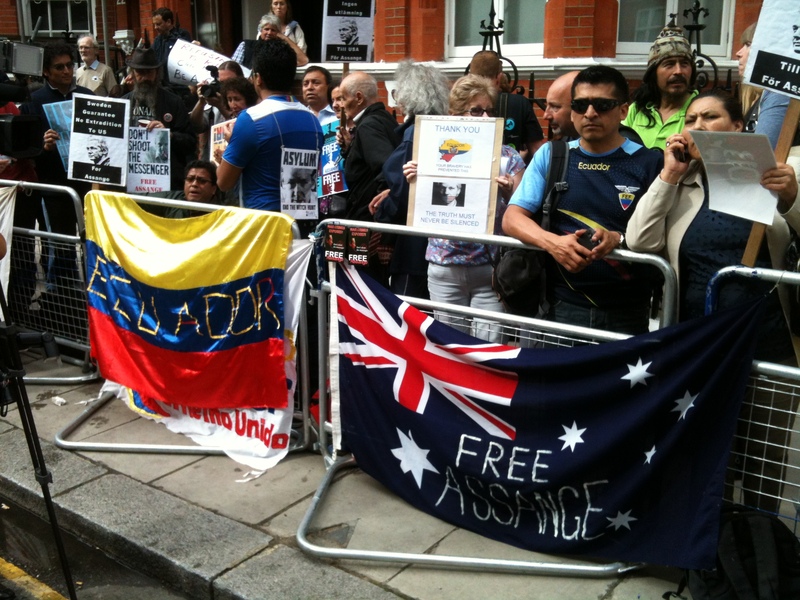 To surround a man granted asylum and charged with no crime, to continue to face-off with Ecuador’s embassy staff and monitor visitors and supporters who vigil outside, serves no purpose other than to convey the true, high-level, political nature of Julian Assange’s persecution. An Orwellian power show employed to contain and suffocate Assange and WikiLeaks in one half of a pincer movement where the public-oriented prosecution from Sweden drags slowly, duplicitously on. We know that from the outset, Assange and Ecuador have been willing to invite Swedish representatives to London to facilitate questioning and move the case forward. At various times this has been rejected by Sweden as improper, but prosecutor Marianne Ny appeared to have an about-face in March when she decided that a London interview was a viable option. 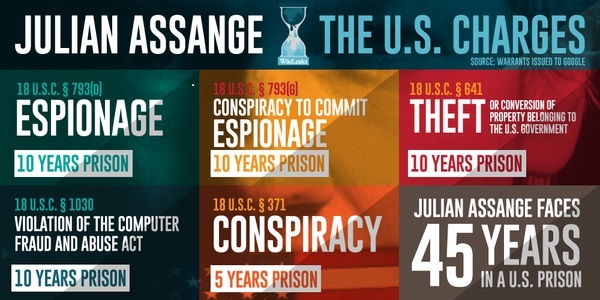 It should be noted that Swedish statute of limitations mean significant proportions of the allegations against Assange expire imminently, on 20 August 2015. Strange then, that Ny has continued to dawdle and waste time – allegedly going through the motions of setting up, then cancelling, a London interview the day before a planned holiday – all the time on the hotline to a hack from Swedish tabloid Expressen (not for the first time). 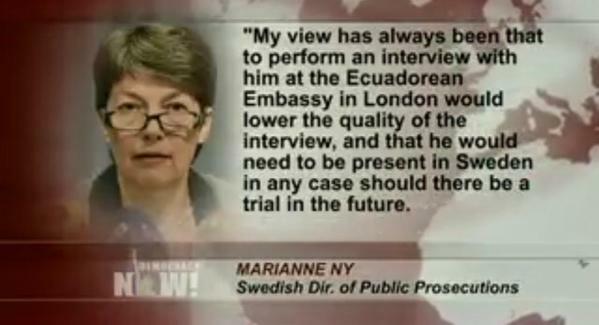 Sweden’s prevarication around a UK interview seems strangely particular to the Assange case. 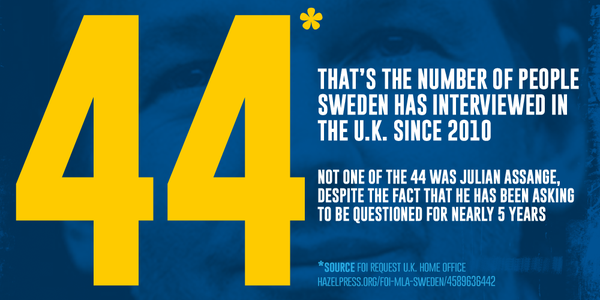 Freedom of Information requests suggest that in the period of Assange’s detention relating to the Swedish allegations, 2010 – 2015, Sweden has requested 44 interviews in the UK. Criticism of Ny’s conduct has been building internationally and at home in Sweden. Again, John Pilger’s excellent piece here is a brilliant summary of her duplicity and obfuscation. On Sunday 16 August please show your support for Julian Assange and Ecuador as their epic struggle continues. Gallery | This entry was posted in Announcements, Assange and tagged Assange, asylum, Ecuador, whistleblowers, WikiLeaks. Bookmark the permalink.